*Data taken from official Sigma Lambda Chi Honor Society website on 3/22/2013. When students finally reach graduation, nothing could give them more pleasure than having their many academic and extracurricular achievements acknowledged and respected. For members of the construction honor societies, these achievements are specific to their major study in construction. For their creativity and determination, construction majors who are members of construction focused honor societies may be offered a green and gold intertwined cord to wear across their shoulders at their graduation. The intertwined honor cord represents, which is made of one part green honor cord and two parts gold honor cord twined together, your students particular abilities and achievements throughout their college and educational experiences, and serves as a reminder of all they have accomplished, as well as all they are capable of accomplishing as they step forward into the future. Some schools may also choose to use a green and gold braided honor cord. To qualify for this high honor, students must not only be accepted into the construction or construction management major at their chosen college, but they must also meet several requirements, such as maintaining a grade point average that keeps them in the top twenty percent of their class, complete a certain amount of upper level course work, and generally embody the character values of the society. Members of construction honor societies are great leaders, likely to become leaders in their chosen field, and dedicated to the improvement of construction technology as well as construction and construction management education. Our green and gold graduation cords, made from all synthetic materials, are the perfect token with which to honor your graduates. These honor cords are long lasting, and will serve as a reminder of your students' academic success for years to come. Green and gold graduation cords will add a subtle gleam of color to the traditional black commencement robes, and, by request, may come already tied for your convenience. 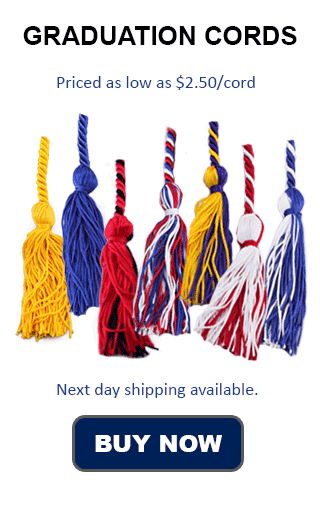 Though there are graduation ropes available through many honor society websites, our honor cords are much more easily accessible, and you cannot beat our awesome bulk rates and flat shipping prices! Don't forget to ask you school administration and local construction honor society chapter for more details about how to wear the honor cord at your commencement.